Here are some snazzy birthday facts about 13th of September 1961 that no one tells you about. Don’t wait a minute longer and jump in using the content links below. Average read time of 10 minutes. Enjoy! What day was my birthday Sep 13, 1961? September 13, 1961 was a Wednesday and it was the 256th day of the year 1961. It was the 37th Wednesday of that year. The next time you can reuse your old 1961 calendar will be in 2023. Both calendars will be exactly the same! This is assuming you are not interested in the dates for Easter and other irregular holidays that are based on a lunisolar calendar. 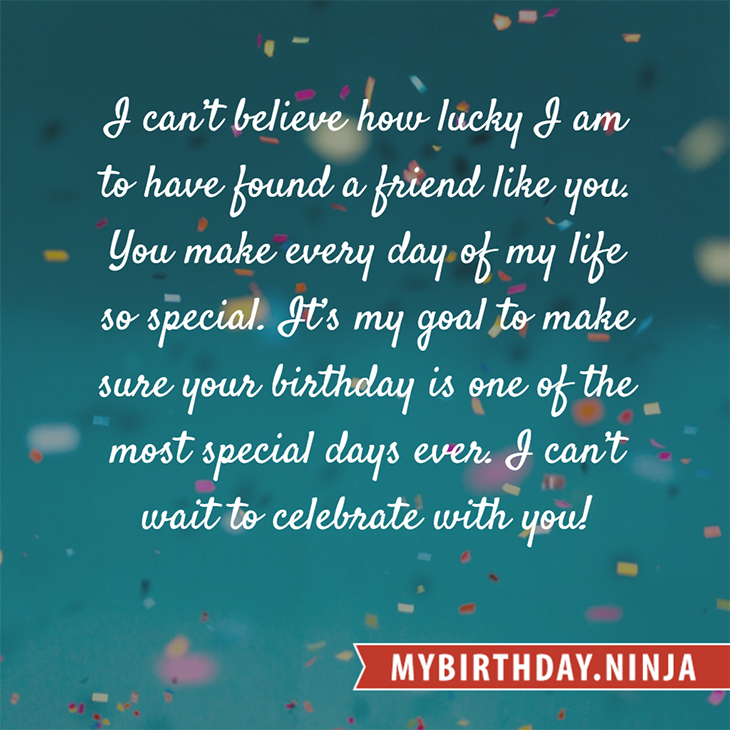 There are 145 days left before your next birthday. You will be 58 years old when that day comes. There have been 21,039 days from the day you were born up to today. If you’ve been sleeping 8 hours daily since birth, then you have slept a total of 7,013 days or 19.20 years. You spent 33% of your life sleeping. Since night and day always follow each other, there were precisely 713 full moons after you were born up to this day. How many of them did you see? The next full moon that you can see will be on May 18 at 21:13:00 GMT – Saturday. Fun stat: Your first one billion seconds (1,000,000,000) happened sometime on May 22, 1993. If a dog named Consuelo - a Goldendoodle breed, was born on the same date as you then it will be 310 dog years old today. A dog’s first human year is equal to 15 dog years. Dogs age differently depending on breed and size. When you reach the age of 6 Consuelo will be 45 dog years old. From that point forward a large-sized dog like Consuelo will age 5-6 dog years for every human year. Henry Hudson reaches the river that would later be named after him – the Hudson River. Super Mario Bros. is released in Japan for the NES, which starts the Super Mario series of platforming games. Goiânia accident: A radioactive object is stolen from an abandoned hospital in Goiânia, Brazil, contaminating many people in the following weeks and causing some to die from radiation poisoning. Largest anti-Apartheid march in South Africa, led by Desmond Tutu. What does my birthday September 13, 1961 mean? Your birthday numbers 9, 13, and 1961 reveal that your Life Path number is 3. It represents vision, imagination and joy of living. You possess a great talent for creativity and self expression. The following celebrities also have the same life path number: Adam Sessler, Gülhan Şen, John Ralston, Burnum Burnum, Simon Amstell, Lori Singer, Sean Faris, Anna Iriyama, Mariko Seyama, Daesung. 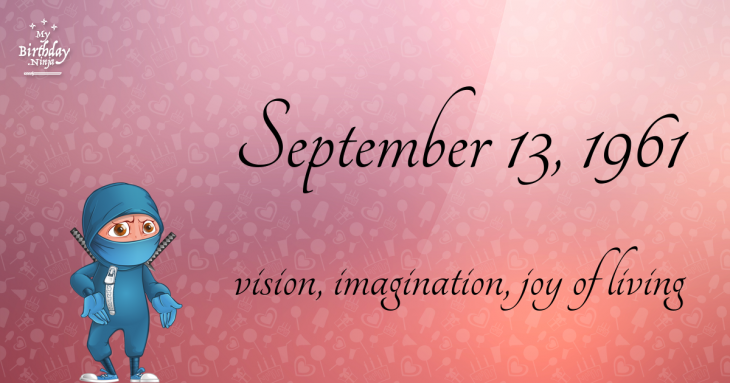 What is the birthday horoscope for Sep 13, 1961? The Western zodiac or sun sign of a person born on September 13 is Virgo ♍ (The Maiden) – a mutable sign with Earth as Western element. The ruling planet is Mercury – the planet of communication. According to the ancient art of Chinese astrology (or Eastern zodiac), Ox is the mythical animal and Metal is the Eastern element of a person born on September 13, 1961. Fun fact: The birth flower for 13th September 1961 is Aster for memory. What is the Love Match for Sep 13, 1961? When it comes to love and relationship, you are most compatible with a person born on June 18, 1988. You have a Love Match compatibility score of +120. Imagine being in love with your soul mate. On the negative side, you are most incompatible with a person born on February 15, 1935. Your incompatibility score is -125. You’ll be like a cat and a dog on a love-hate relationship. Arf-arf, I want to bite you. Meow-meow, stay away from me! How many babies were born on September 13, 1961? Base on the data published by the United Nations Population Division, an estimated 109,557,830 babies were born throughout the world in the year 1961. The estimated number of babies born on 13th September 1961 is 300,158. That’s equivalent to 208 babies every minute. Try to imagine if all of them are crying at the same time. What is the popular baby name on 13 Sep 1961? Here’s a quick list of all the fun birthday facts about September 13, 1961. Celebrities, famous birthdays, historical events, and past life were excluded. Try another birth date of someone you know or try the birthday of these celebrities: June 1, 1983 – Jake Silbermann, American actor; April 19, 1966 – Julia Neigel, Russian-German singer-songwriter and producer; June 12, 1986 – Carla Abellana, Filipino model and actress.